Rates High North Outfitting fly-in hunting and fishing camp in Quebec. The following rates are per person in U.S. Funds or equivalent. A deposit in the amount of $1000.00 is required to secure your date and rate with the final balance being due June 01, 2018. Balances not recieved by June 1st will be deemed as cancelled and no refunds will be reimbursed. 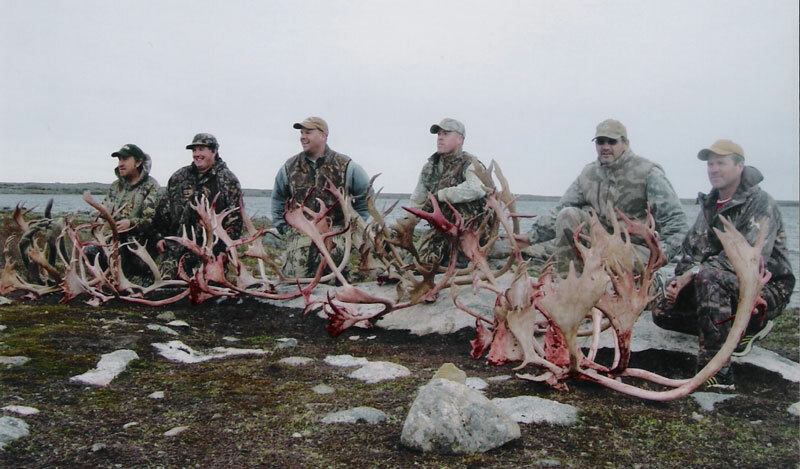 Caribou Hunt Rate: NOT IN QUEBEC!!! All Caribou hunts for the entire province of Quebec have been closed to "sport" hunting until further notice. I expect it to never re-open. In such, I have set up operations in Greenland for both Central Canadian Barrenground Caribou as recognized by P&Y as well Grand Slam. The caribou hunt can be done as a single species or the combination of Caribou and Muskox and will start as early as Sept. 2018. I will have Spring Muskox Hunts starting this March / April and are very reasonably priced. Please contact me for more information. Newfoundland: In addition to offering Central Canadian Barren Ground, I have also teamed up with a great outfitter in Newfoundland and can now offer Woodland Caribou, Eastern Canadian Moose and Black Bear on the Island. All can be done as single species or combinations of any. Note: Package also includes airfare for one dog per hunter. Extra dogs can be brought at my cost of $500.00 / dog. During the ptarmigan hunt, clients are welcome to purchase additional licenses which would allow them to fish or ptarmigan hunt during open seasons. The cost of the licenses are indicated below and are available at camp and payable by cash. Due to our advance commitments with aircraft, guides and equipment we must set out the following conditions in the event you must cancel your trip and are not able to find a replacement. They are set as follows: A 100% refund, less $500.00 will be issued for any cancellation received in writing 121 days or more prior to the scheduled hunt date. From 0-120 no refunds will be issued, however a replacement hunter can be substituted. Once booked for your hunt you will be provided with a unique user name and password that will allow access to our very detailed trip preparation information that is available on our website through the Client Hunter Login link on the Home Page. It is very complete and will provide not only an equipment checklist, contact information for hotels, flight itineraries and confirmation numbers; it also has a very detailed list of equipment including best types and models proven in time for this area. High North Outfitting Inc. and/or its agents do not assume nor shall be liable for any injury, damage or loss of any nature what so ever caused or occasioned by neglect, default or by any act of commission and/or omission, whether negligent or not, of any person, company or carrier, nor of their respective representatives, servants and/or employees. Flight delays may be encountered due to causes beyond our control; such as inclement weather. In the event of such delay, we cannot be held responsible for shortened holiday time, missed connections, extra expenses such as food and lodging or other loss or damage which may result. In the event it becomes necessary or advisable for the comfort or well being of the individuals or for any reason whatever to terminate, amend and/or cancel confirmed reservations for any period, or portions thereof, due to strikes, national emergencies, weather or similar situations normally referred to as Acts of God, or any situation which is believed to be in the best interest of the guests of High North Outfitting Inc., such action will be done without penalty to High North Outfitting Inc., companies, corporations or persons participating in this operation. Should illness, safety or personal reason necessitate the evacuation of one or more customers, the evacuation expenses will be paid by the individual client(s) involved. Each hunter will be required to sign a liability waiver upon booking.